Need a guide to take you through the world of Crossfire? After completing the Beginner's map it's time to sell all the treasure you've accumulated. Proceed to the northwestern (upper left) area of Scorn and look for the Magic Shop ( ). Stand on top of the tower and press the 'A'-key, that's how you enter most maps. Once inside the Magic Shop, you'll see the following: an altar ( ) for the detect magic spell, an altar ( ) for the detect curse spell, a table ( ) for the identify spell, a sign ( ) listing the store's inventory, a special teleporter ( ) for entering the buy/sell area, and the entrance/exit ( ) back to Scorn. The first thing to do is make use of the detect magic ( ) and detect curse altars ( ). What if an item is both magical and cursed? Now, enter the shop via the special teleporter ( ). Once inside the buy/sell area, any item that is dropped will be considered sold - immediately! Even if you drop an item by accident, it is considered sold. If you want it back, you will have to purchase it. 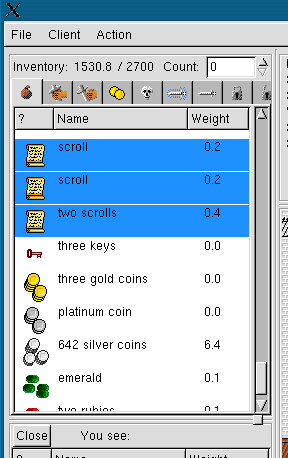 Also, the money obtained for selling items is automatically added to your inventory. Now, exit the buy/sell area and proceed to the blue table in the lower corner. This is the identify table and it has a very different function when compared to the detect curse and detect magic altars. The 20gp required only identifies one item in your inventory - the top most (unidentified item) whether or not it's magical, cursed or normal. Activating the identify table ( ) is similar to the other altars. The identify spell will be applied to the top-most, unidentified item in your inventory. Note: if you drop the equivalent of 40gp, then two items will be identified; 60gp for three items, and so on. 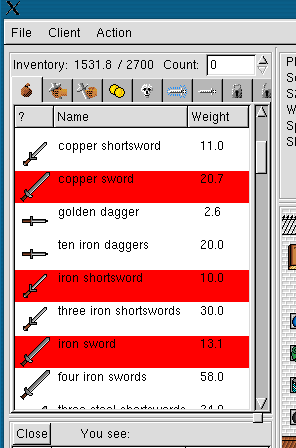 The message window will show the full stats of the identified item(s). Remember - pick up any left over change when you are done using the altars and table. Now it's time to upgrade your equipment, assuming that your race or class allows you to wear armour or wield a weapon. Exit the Scorn Magic Shop and proceed to the east to the Armour Shop ( ). 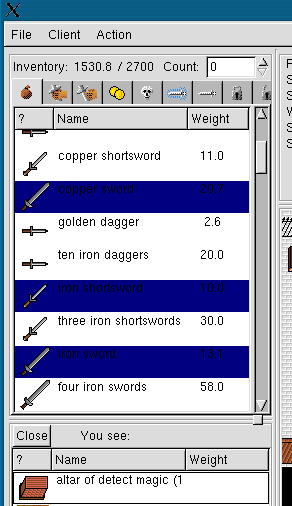 Compare AC, Armour and weight values - is it an improvement over your existing armour? Armour Class: What modification is applied to the wearer's AC, which relates to how protected the character is from being hit by any attack. High values are better. A low AC value (even negative) are better. Armour: What modification is applied to the wearer's Armour, which relates to wow much damage will be subtracted from successful hits made upon the character. This value ranges between 0 to 99%. High values are better. Weight: How heavy the object is. The heavier the object, the more likely the wearer will experience arcane spell failure. This also has an effect on the wearer's movement and attack speed. Low values are better. If you still have any money left over, and your class or race allows you to wield a weapon - consider upgrading it. Exit the Scorn Armour Shop and proceed to the west to the Weapon Shop ( ). Once inside the entry area.. Compare the Damage, Weapon Speed and Weight values - is it an improvement over your existing armour? Damage: The number of Hit Points subtracted from the target's total Hit Points per successful melee strike. High values are better. Weapon Speed: Influences attack speed or rate. Low values are better. With your new equipment ready - head to the Newbie Tower. Notice how the walkthrough did not include how to purchase spell or prayer books?